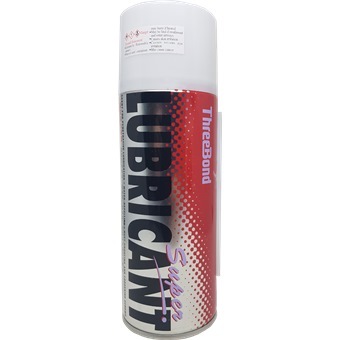 THREEBOND SUPER LUBRICANT 400ML TB1803C is rated 5.0 out of 5 by 1. ThreeBond Super Lubricant is a spray lubricant that will penetrate rust and loosen screws, nuts, bolts and other metal parts. Will also stop squeaking and protects moving metal parts with a non-drying invisible film which prevents further rusting. For use on industrial fittings, electronic equipment. It also repels water on marine equipment and automotive applications. Rated 5 out of 5 by anai from Low price. Good performance. For $4.50, it is the lowest price for such a large can of lubricant. I have checked the original price. It was actually $10+.